GoAbroad.com gears up to recognize and celebrate innovation in international education with the 4th Annual GoAbroad Innovation Awards. Nominations are now being accepted through April, 4, 2014. These awards recognize and celebrate those who are creating initiatives to move the field forward and commend leaders in the community for their efforts to go beyond the conventional. 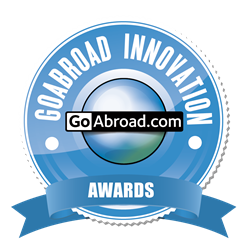 GoAbroad.com is thrilled to announce the nomination form for the 2014 Innovation Awards is live, and individuals are encouraged to send in their submissions. Nominations will be accepted until Friday, April 4, 2014. The STA Travel Start the Adventure Award will recognize an individual who has made meaningful travel more accessible to students and young travelers. Award nominees can either be a student, alumni, or professional. Two STA Travel vouchers (valued at $1000 each) will be distributed alongside the award. One STA Travel voucher will be given to the individual winner and the second voucher is awarded to the winner’s organization/institution. Nominations are for the Innovation Awards are evaluated and decided upon by a selective group of international education professionals known as the Innovations Academy. Individuals may nominate their own or another organization/institution, as well as other individuals for an Innovation Award. Nomination instructions and important deadlines are included on the nomination form. GoAbroad.com has been the web’s premier resource for meaningful international experiences and alternative travel opportunities for fifteen years, providing the most up-to-date and accurate information on programs available worldwide. From GoAbroad’s GoMedia services, which offer a distinct range of internet marketing solutions for international educators, to the prestigious GoAbroad Innovation Awards, and the newest initiative – FundMyTravel – an online crowd funding site to help students raise money for meaningful travel experiences, the GoAbroad team is dedicated to providing the most comprehensive resources to the field of international education.